There are currently 87,959 users on this website. 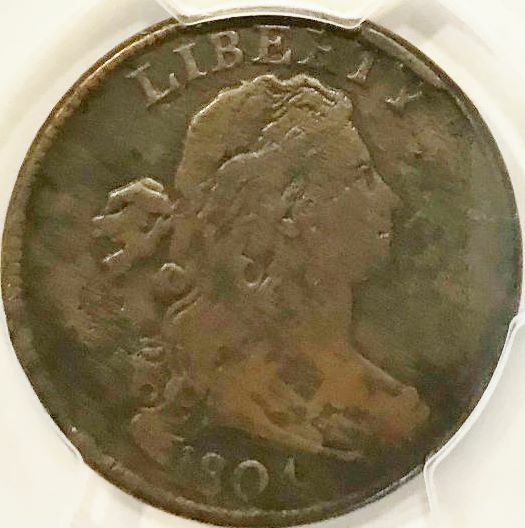 1804 Large Cent - PCGS Certification Mistake? I started a thread back in november concerning grading my coin. The consensus was that it had environmental damage. When I received the coin from PCGS, it says that it was repaired, which really confused me, because I see no sign of repair. Now, I look up the certification, and it says that it has damage. So the label does not match the certification. I plan to call PCGS for an explanation, but has anybody else ever experienced this? Finally, the coin is placed in the holder such that it is tilted back. You can't tell from the picture, but it is seated properly in the grooves of the tabs at 4 o'clock and 8 o'clock, but it is wedged against the back of the case at the 12 o'clock position. I tried tapping it to get it to drop into the groove, but it didn't move, and I didn't want to be too forceful. Others will be able to address your direct concerns. I just want to comment on your image. 1. It's best to include images of both sides of a coin when you post here. 2. The coin itself is VERY dark in your image. Instead of a light/white background use a non-reflective black/dark gray background. Too much light is coming from your background. You want most of the light that the camera sees to come from the coin. I appreciate your points Kanga, but in this case I was just trying to capture the label on the holder. I actually didn't even look at the coin in this picture, and you are correct - it is very dark. The thread I linked has better images, and the certification link has the PCGS trueview image as well as a different certification than shown on my label. I'm interested in why they are different and if anybody has experienced something similar. The coin looks very attractive in the TrueView images. 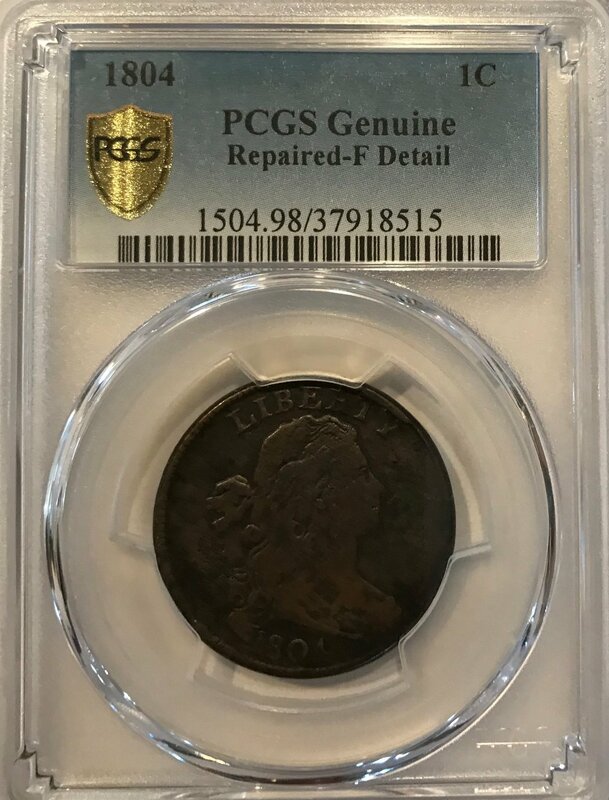 PCGS apparently considers repairs to be a form of damage, and they will indicate the type of damage on the label (#8 on their list of types of damage). I don't see any obvious repairs either, but maybe it was smoothing out some of the corrosion. I would probably have them reholder it because of the tilting of the coin. You might have to send some side pictures of the slab to show them first. Thanks for pointing that out. I see now that the "repair" is a subcategory of "damage (98)". Still a lovely and very scarce coin in any grade. The coin may be tilted because it is a slightly bent or out of round planchet, whether struck that way or damaged. I have had that happen before when the coin's diameter was just a bit non-standard, especially on early copper. Still very nice even with a Details grade. IMHO, this is a most pleasing obverse for a details or repaired coin! We collectors do appreciate good coin pics, too! Might the damage have been a bend in the coin that was "hammered" or repaired by being flattened? Nice coin and I'd send it back for a re slab. As far as the pic in the OP, I was just interested in capturing the label. The OP has links to another thread with pictures, as well as a link to the truview on PCGS.